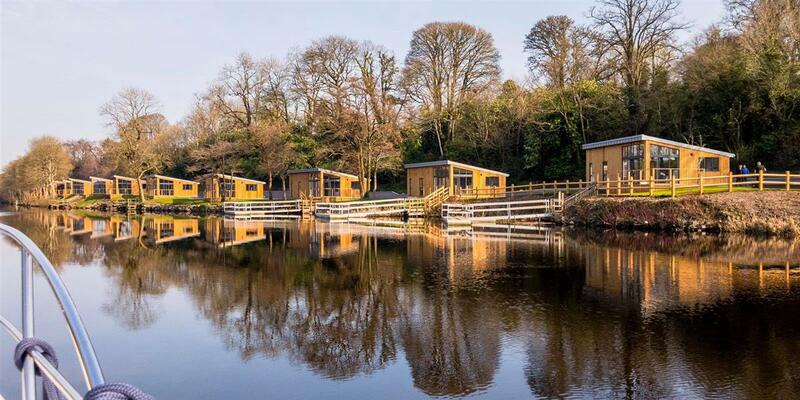 Located on the beautiful banks of Lough Erne, adjacent to the Killyhevlin Lakeside Hotel, our collection of 14 larch wood log panelled Lakeside Lodges are a unique self-catering accommodation style experience for visitors to The Fermanagh Lakelands. Each 2 bedroom Lodge directly overlooks Lough Erne and has been designed to a high standard with complimentary Wi-Fi, a fully equipped modern kitchen, ensuite bathrooms complete with bath and luxury walk in shower, open plan lakeview lounge leading onto a private furnished decking area. The stylish modern interiors are the perfect holiday home accommodation in Northern Ireland and ideal base for family, groups and activity breaks (sleeping up to a maximum of four). We have two dedicated Lodges that are pet friendly. Together our Lakeside Lodges can provide lodge stays for large family groups of up to 56 guests. Guests can enjoy the stunning Lakeland views directly from their dedicated private jetty available upon request, making them the ideal holiday cottage base for both boating and angling self-catering short breaks (subject to availability). Your Lakeside Lodge facilities are fully modernised and include a granite finished cooking station and dining area, integrated Washer/dryer, dishwasher and fridge/freezer. Within a short stroll of your Lakeside Lodge is a choice of 3 dining experiences; choose from fine-dining in Kove Restaurant, casual dining in Boat House Grill, to relaxing Afternoon Tea, we've got something to suit every taste. Luxury hotel facilities also includes one of Northern Ireland’s top spas with a full range of Elemis, treatments and packages (pre-booking essential). Lodge guests have complimentary use of the Killyhevlin Health Club complete with indoor swimming pool, outdoor hot tub, sauna, steam room, kids pool and Technogym fitness suite.